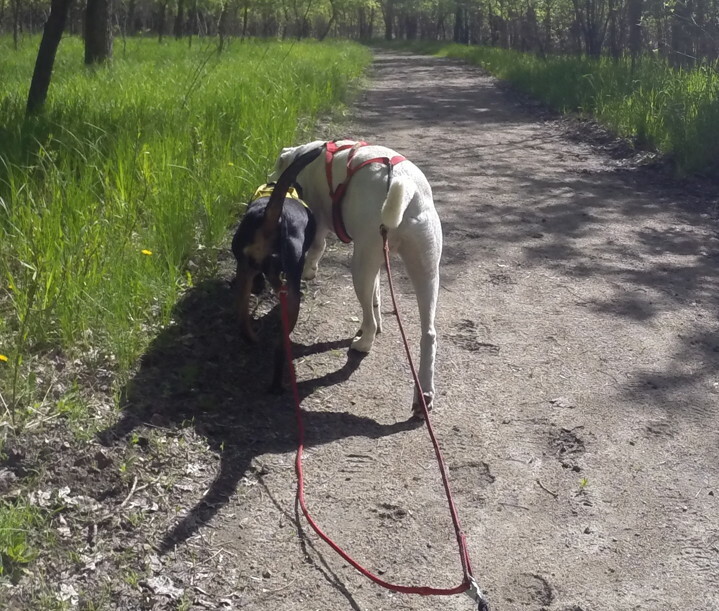 I don’t normally run the dogs two days in a row, but yesterday was a short-ish run, it’s an absolutely beautiful day today, and we were all feeling good and energetic. So I decided to drive down to the Mendota Trail and see how spring has been treating it since things dried out a bit around here. We had a nice, easy run. 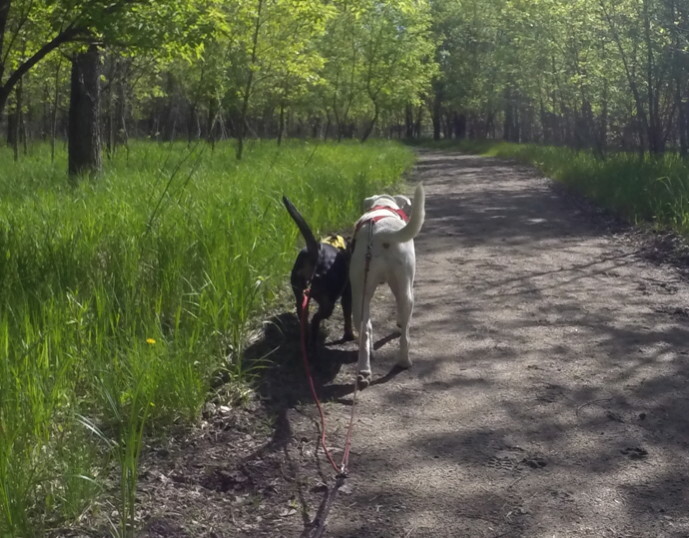 Most of the trail is very wooded, so nice and shady, and the surface is nice smooth packed dirt: The scooter runs really easily over it AND it’s nice and easy on the paws. I had the GoPro mounted on the handlebars on continuous photo mode for awhile, and I happened to catch the infamous “Maisy Bump” which is always funny for me to see broken down into stills. 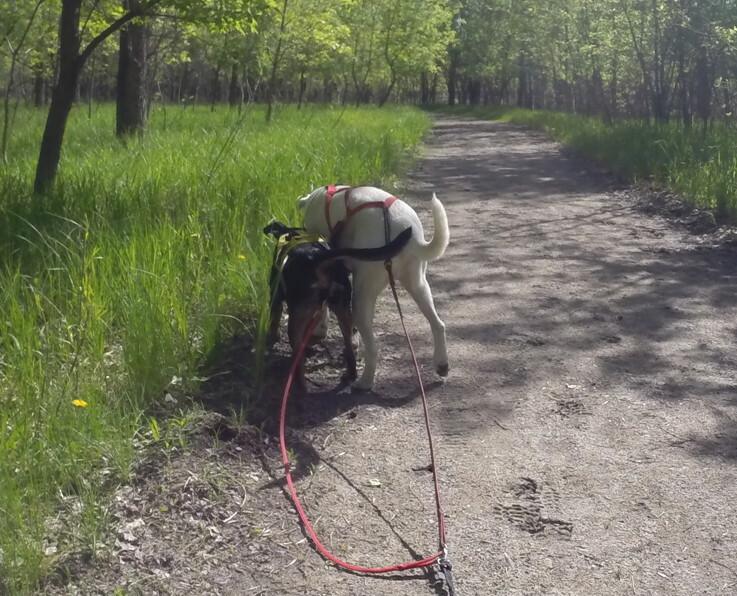 Squash has become distracted by something on the left side of the trail. Maisy has already slacked up a little in preparation for her response. When Squash makes his move, Maisy digs in and body blocks him. This ultimately culminates in a shoulder check (not captured on film). Having successfully shoved Squash back onto the trail, Maisy gets what she wants (to keep running forever or as close to forever as she can get) and we continue on our way. I have no idea why he even attempts this stuff any more. This scenario plays out at least 2-3 times per run, and it’s a very, very rare occasion when she becomes interested enough in whatever he’s interested in to allow it to play out differently. She just wants to run and run some more, and she isn’t going to let him mess that up for her. This entry was posted in Maisy, Scootering. Bookmark the permalink.